The most important function of MaxAim DI is how it converts your mouse input into controller stick positions. Console shooters were never designed for mouse control, so, incorrect conversion results in poor aim. The mouse settings panel features all possible adjustments you may need to achieve a PC like movement between your mouse movement and the in-game reticule movement. Set the in-game sensitivity to the highest, and set the system mouse DPI to the highest value. Configure the mouse DPI as described in section 11. Set the smoothness as described in section 1. Adjust the deadzone (section 7), until you feel there is no more "gaps" performing slower movements. Set the deadzone shape value (section 8). Adjust the acceleration (section 3), until you feel the mouse movement is linear in relation of in-game reticule movement. Start the circle test, as described in section 10. Adjust the sensitivity (or acceleration) ratio (section 4), until you get a perfect circle. Adjust the overall sensitivity (section 4) to your personal taste. The mouse motion can be smoothed using previous mouse motion values, this is useful for lowering jerkiness, especially with a low DPI mouse (below 2000 DPI). MaxAim DI uses a non-linear filter of averaged mouse input over time, where the configuration value (X, Y) dictates how much the older values will have influence over the filtered result, in that specific axis. Bigger the configuration value, smoother will be the mouse movement. But there is a catch, the mouse responsiveness is also affected. This graph shows the mouse responsiveness based on the smoothness settings. The goal is reach the top value as soon as possible, but with enough amount of smoothness required by your mouse. The red curve represents the X axis and the blue curve (not shown in this example) represents the Y axis. As the smoothness setting gets bigger, longer will be the time necessary to reach the top value. 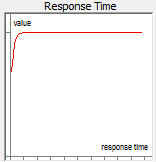 This interval is called "response time", also know as "input lag". The acceleration parameter changes how the game's reticule will respond to slow and to fast mouse movements. Values higher than 1 increase the effective acceleration, making the game's reticule move slower at slow mouse movements, and faster to fast mouse movements. Whereas values lower that 1 decrease the acceleration and have the opposite effect. The goal is cancel the in-game acceleration, which is generally positive, meaning you have to find out the acceleration setting (usually between 0 and 1) that cancels the in-game acceleration. This setting is usually the third one you will make changes. The sensitivity parameter is nothing more than a multiplier, the input motion is multiplied by the configuration value, expanding the output motion range. Increase this setting if the in-game movement is too slow, or decrease it if the in-game movement is too fast. This setting is usually the last one you will make changes. 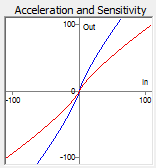 This graph shows the effect of acceleration and sensitivity adjustments, where the input values are expressed along the In axis and the correspondent output value along the Out axis. The red curve represents the mouse X axis and the blue curve represents the mouse Y axis. 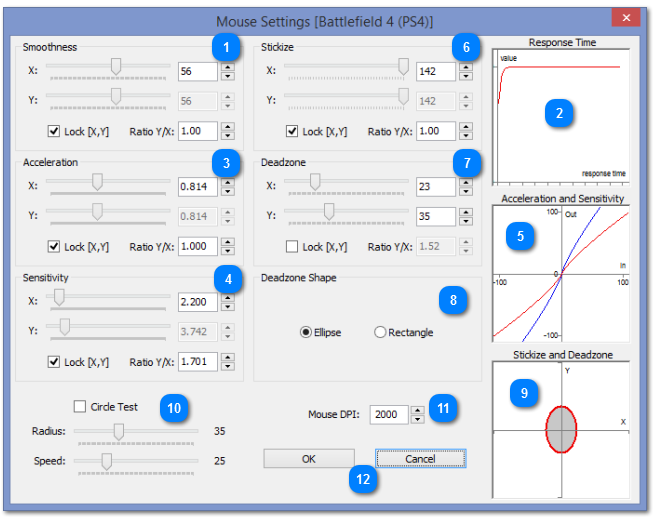 Converts the values of mouse input to match the circle area of the analog stick. The possible values ​​of the analog sticks are usually confined to the area of ​​a circle, being impossible reach the maximum values ​​in the diagonals. Some rare games try to fix it, which results in much more sensitive diagonal movements. In this case, the sitickize setting can be adjusted to cancel this effect. The dead zone parameter allows to shift the stick positions away from the analog stick center, this enables to skip all the stick positions around the analog stick center that do not generate in-game movement (these positions are called the dead zone of the analog stick). If lowest input motion do not generate enough movement, increase the dead zone parameter. Console games usually apply different deadzone values for the X and Y axis. This setting is usually the first one you will make changes, as explained in the guide Finding the Game Deazone. The deadzone shape can be set to either rectangle or ellipse. As you can adjust independently the X and Y it is possible to cover any possible deadzone shape. For example: to make a circle deadzone select the ellipse shape and lock the X/Y on deadzone settings, with a ratio of 1.00. This setting is usually the second one you will make changes. 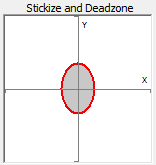 This graph shows the shape and the area of stickize and deadzone adjustments, where the gray region corresponds to the affected area. The red border delimits deadzone area and the blue border (not shown in this example) delimits the stickize area. The circle test will simulate a continuous mouse circle movement using the radius length and speed value of the correspondent controls. Check the checkbox to start the circle test and adjust the circle radius and speed if necessary. Tweak the mouse settings as described in each section until the in-game reticule start moves in a perfect circle. Set the mouse DPI value to match exactly your mouse DPI capability, a mismatching value can result in jerkiness. Mouse with 2000+ DPI is highly recommended. Whereas a gaming mouse with more than 1600 DPI doesn't really make any difference on PC, it's not true with MaxAim DI, because the mouse movements can be decelerated to counteract the in-game acceleration. So, a high DPI mouse gives a better linearity (i.e. smoother movements) in this specific case. Press OK to apply and save the settings, or Cancel to discard any changes. Both button will close the Mouse Settings window.